Taking the ferries over to Victoria is a popular day-trip for visitors to the Vancouver area. 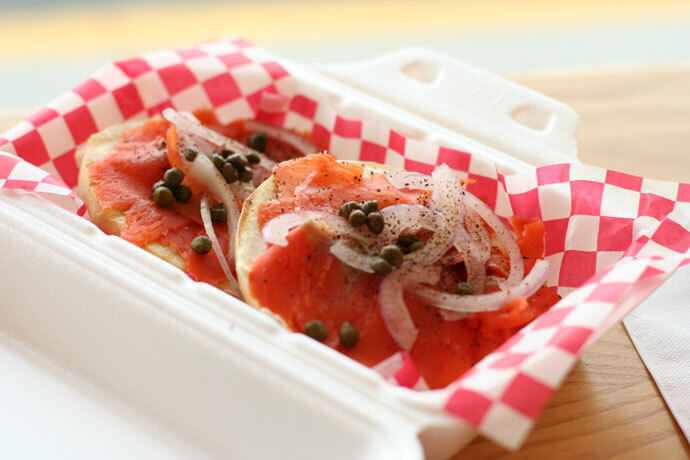 The ferry terminal at Tsawassen (on the Vancouver side) has a marketplace with a variety of vendors serving delicious food, such as Taste of BC (web site) which serves fresh and smoked BC salmon. I ordered the Smoked Salmon bagel (pictured below, $6.95) which was served with fresh smoked BC Salmon, onions, capers, and cream cheese. This was a special treat while waiting in line for the ferry. 22,839 views. This entry was posted on Tuesday, December 18th, 2007 at 10:00 pm	and is filed under Affordable, Casual, Creative Dishes, Healthy Food, Lunch, Reasonably Priced, Restaurant, Seafood, Vancouver, Victoria. You can follow any responses to this entry through the RSS 2.0 feed. You can leave a response, or trackback from your own site.